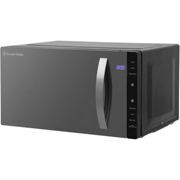 With Pricehunter, you can compare prices online in order to find the offer that most fulfills your requirements "flatbed microwave". Based on your search criteria "flatbed microwave", our price search engine found the lowest prices in 6 categories. Lowest prices found in 8 different online stores, including Lookagain.co.uk, Appliancesdirect.co.uk, Littlewoods.com and johnlewis.com. If you would prefer an item from a particular brands, you can find 3 retailer for this product. If you have not yet made a decision, you can also filter your favourite producers and choose between 3 manufacturers. 3 different brands offer the product - Russell Hobbs, Panasonic and Hotpoint, that you were looking for. Furthermore, other costumers also looked for the following product Retro microwaves, Green microwaves and Daewoo Microwave. With Pricehunter you are also spoilt for choice for colours. You can select your favourite from 5 shades. The article is most commonly ordered in the colour Black.